Nurses in Nyeri County down tools demanding delayed allowances – Kenyatta University TV (KUTV). All Rights Reserved. 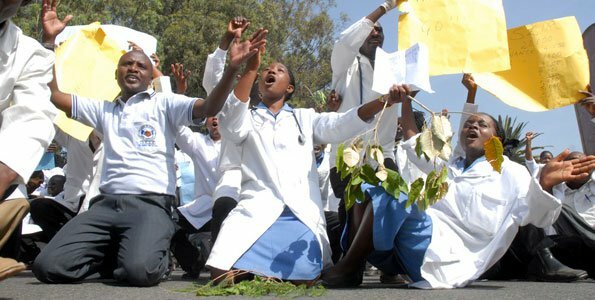 Nurses in Nyeri County today downed tools demanding immediate payment of their allowances by the County government. Speaking to the press in Nyeri town, Kenya National Union of Nurses (KNUN) Nyeri branch secretary Beatrice Nduati vowed not to resume duty until their demands are met. They accused the devolved unit of dodging them and making empty promises that are never fulfilled. Ms Nduati dismissed a letter from the CEC Finance sent through the social media asking them to return to work as their payment will be honored by end of this month. “That letter is unacceptable and we do not work through the social media,” Nduati who was accompanied by the branch treasurer Boniface Maina and other nurses said. She added “we received a letter in our social media platforms from the CEC Finance but we can’t accept it since the actual money isn’t indicated, none of our officials was involved and also the letter was channeled through the wrong platform”. She said they were not involved when this letter was being written and that it doesn’t have a signature from any KNUN official. The nurses at the same time demanded that health services revert back to the National government stressing that county governments have failed the sector. “The drafters of the 2010 Constitution overlooked the sector when they devolved it. Let the sector be managed from a centralized point,” Nduati said. They said that patients were being evacuated from county health facilities but those in ICU, renal unit and newborns will continue to receive services. “We are not going to close the ICU, Renal Unit and the newborns,” Nduati said. Nduati also challenged the county government to borrow a leaf from Nyandarua county government as they called their members and ironed the problem out.